Since 2009, the bx_digital V2 EQ plug-in has been an indispensable tool for many of the world's top mixing, mastering, and post-production engineers with its precise, in-depth tone shaping and powerful M/S (mid/side) processing. Developed by Brainworx, the new bx_digital V3 EQ Collection for UAD-2 hardware and Apollo interfaces offers a dramatic update to the popular V2 EQ plug-in, giving you enhanced flexibility and signal-shaping power. The new bx_digital V3 plug-in boasts an extended range of the high frequency EQ, going up to 40 kHz. This gives you the ability to add air and gloss to vocals, overheads, or an entire mix. The V2’s old de-esser section has been transformed on the V3 into a dynamic EQ section, able to boost or cut a specific frequency band depending on the input signal. This gives you added flexibility way beyond traditional de-essing. The V3 EQ’s revamped Bass and Presence shifters now offer three tones of tilt EQ, so you can better dial in the character of your treble and bass frequencies. Also, the new Proportional Q function allows you to easily go from broad stroke EQ moves, to surgical ones. 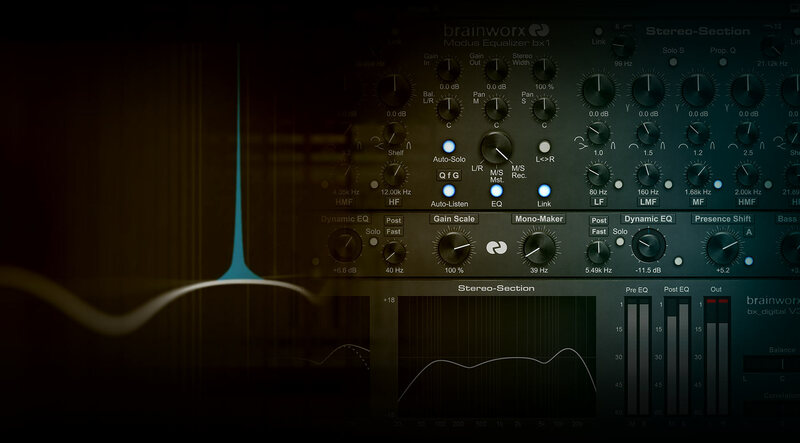 Brainworx’s legendary M/S processing gives you a simple workflow to dramatically tweak the width and depth of your mixes — from subtle enhancement to problem solving. The Mono-Maker control sums your low-frequency content to mono, giving you focused, punchy bass response.